English fruit tarts – MostlyAboutBeer…….. Sour beer has really taken off in Britain. It was exotic just several years ago, known only to connoisseurs who’d explored the beers of wider Europe. 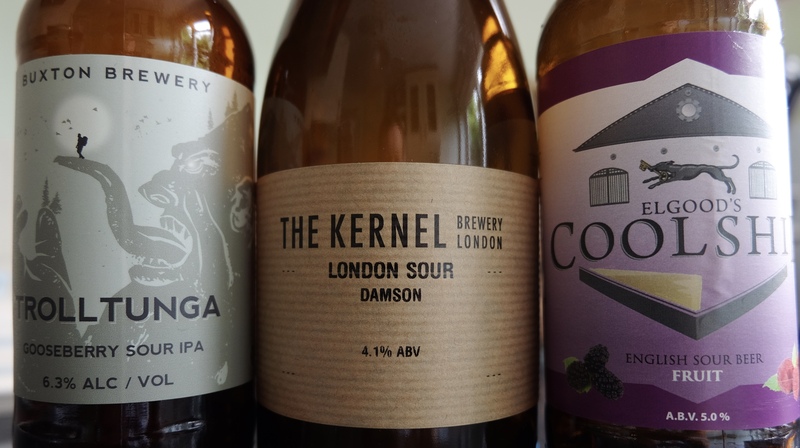 My first ever sour was by Kernel but now it’s part of every new brewery’s core range. 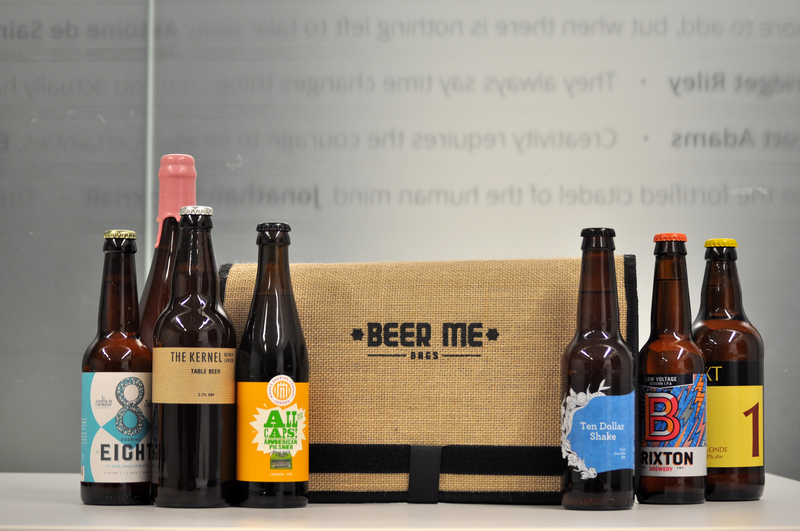 Most traditional breweries are yet to catch up – maybe in part because it’s not a style suited to cask condition but I believe that the older boys will jump on board just as they did with black IPAs. If you were brought up in northern Europe, you might always have had a sour tooth. Why? Just follow this sentence. Elgoods brewery, hailing from Wisbech in Cambridgeshire, is one of the country’s most traditional and is an exception. Its recent employment of a coolship in the loft of one of their brewery buildings was a very radical move for a purveyor of bitter and milds. A coolship is a large fermenting tank open to the air. Airborne yeasts kickstart the fermentation rather than being introduced by the brewer. It’s how Lambic beer is brewed in the Pajottenland in Belgium. With unregulated wild yeasts, the brewer needs to keep their fingers crossed. We can’t use the L word here though as it has protected geographic status. 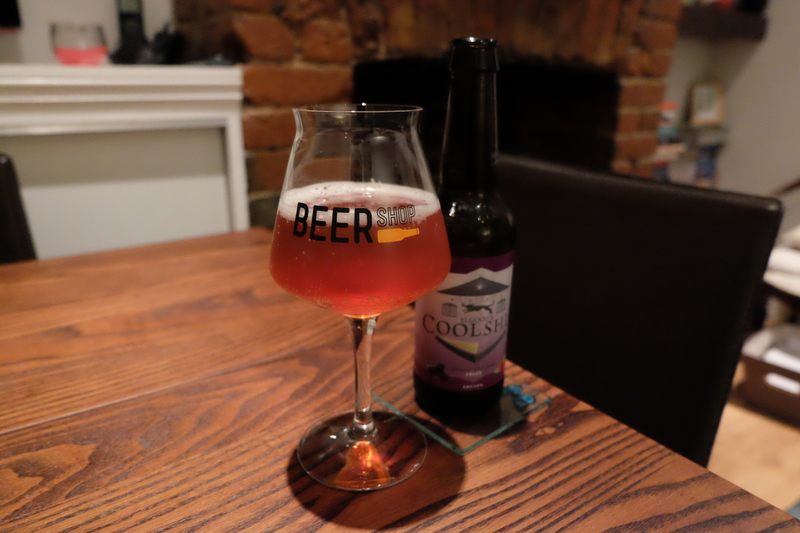 For the fruit version of their spontaneously fermented beer, Elgoods have steeped raspberries and blackberries in it. The pour reminds me a bit of decanting a bottle of pink Lambrini – the staple free bottle of plonk gifted to children when they turn eighteen at nightclubs (no I didn’t). It’s like carbonated rose wine the blush is of the resin on toffee apples. There’s an off-white corona of a head that swirls around – a spiral galaxy imploding. The nose is beautiful. It reminds me of grenadine syrup or even Vimto. It’s the smell of my own hands after scrumping brambles and dewberries as a child. The beer’s very carbonated on the sip: it hits the tongue fizzing. It’s nowhere near as sour an experience as I’d anticipated. Nothing like, say, a brett beer. It’s tart-sweet – the fruit pushing through the most is the raspberry. It’s never sharp enough to make you squint. I can still feel the buoyancy of the malt through all this. It thickens the liquid into a kind of fruit compote. There’s absolutely no dryness or indeed bitterness. Just the tart-sweet. A very refreshing beer but with no real complexity. In fairness, it never claimed it. It’s a showy extrovert rather than an introvert. On the eye it’s a hazy dingy yellow. The head is white and pockmarked like grouting. The aroma is sour, unripe, aggressive, not ready to be eaten, gorgeous. It’s like you’ve sliced into something green and organic and the acidity’s seeping out like milk. It makes your eyes water. The liquid washes over the tongue like a cold tide across a fever. Sour and sharp, it passes through the roof of your mouth to the back of your eyeballs and unfocuses them. It’s strongly carbonated too which helps spread it further quicker. Osmosis drags it in and hastens the intoxication. The pincer movement of nose and palate causes acute goosebumps. It cuts straight through. Goose grass with its barbs, gooseberries with their sharpness, goosebumps in defence. It stays the safe side of heart burn proving the brewer’s crafted it, not lost control. You open and shut your mouth like a goldfish. You lick your lips like a lizard. It’s so sour. This beer screams out for a soft rich fatty cheese to balance it out in a seesaw of extremes. It’s piercing and makes your tense gimlet eyes equally so. Beautiful. 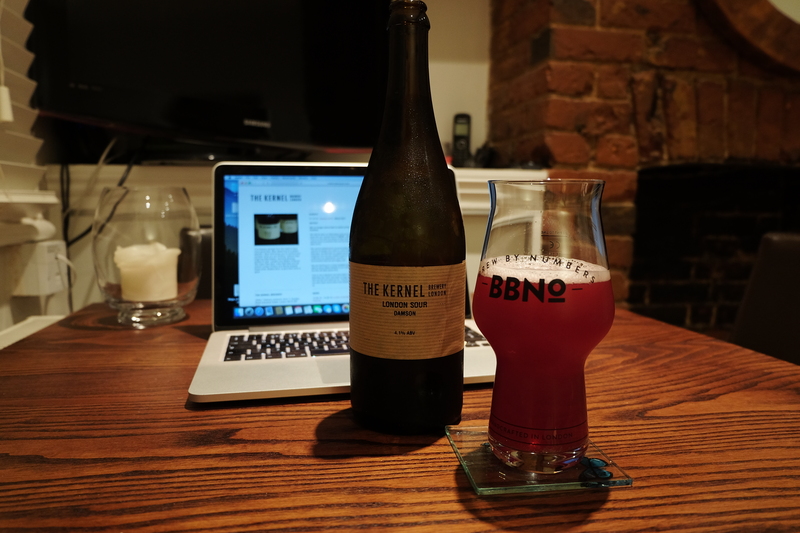 Bermondsey’s offering pours a pinky purple with a gentle carbonation. You can see bubbles erupting on the surface like a volcano crater pool. It looks like beetroot juice. A half moon of light beige froth coronas the crater. I smell fermenting fruit – it’s like a food waste bin in the heat of summer. Bacterial breakdown is happening with a red wine balsamic edge. It’s so gentle when you swig it – the first beer out of this trio to soothe despite being a sour. The flavours come through after a short delay. It’s suave and restrained in its taste. There’s the sensation of eating handfuls of red currants. The plum (damson) is of the tartest variety but not to the extent this becomes puckering. It’s still sharp – slightly unripe pink rather than soft blue but carrying enough sweetness to make it sociable. The mouthfeel is smooth and the liquid on the palate is tangy rather than fizzy. It’s almost as creamy as a fruit smoothie. There is absolutely no dryness to this. It’s a gorgeous beer but very polite. It has a U rating and can be shown on mainstream TV in the early afternoon. Its strongest facet is the unabashed aroma of decay and fermentation. I love it. All three beers raise the bar for the style. 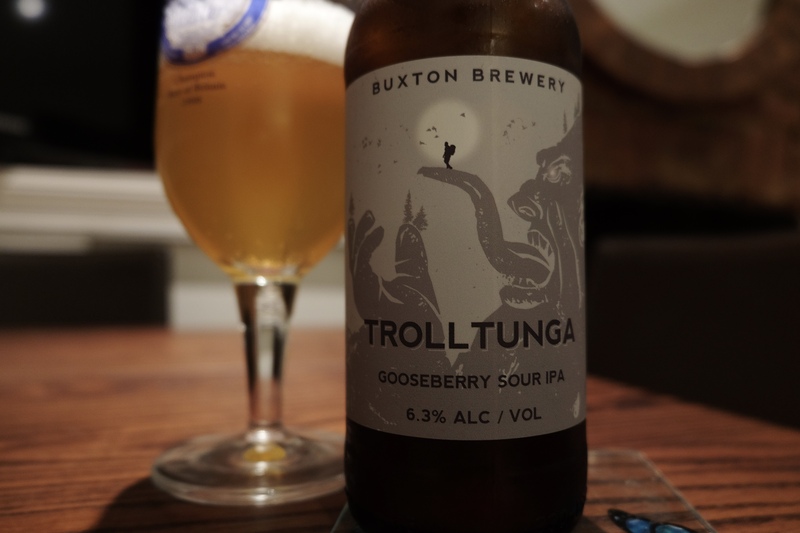 Each can definitely come back to my boudoir but I do have a favourite in this vertical taste-off and it’s hands-down Trolltunga. Without overbalancing, it just kept its passion so that the finishing sips were as purging as the first. It wasn’t afraid to come on strong and forced you to sip it respectfully.